Preparations and decades of mitigation efforts in northwestern Minnesota have left the region in a relative calm as the Red River undulates northward, cresting at or near predicted levels so far in Wahpeton, Hickson and Fargo, N.D. Crests are expected later this week in Halstad, Minn., and Grand Forks, N.D., well under record levels, if anticipated conditions persist. 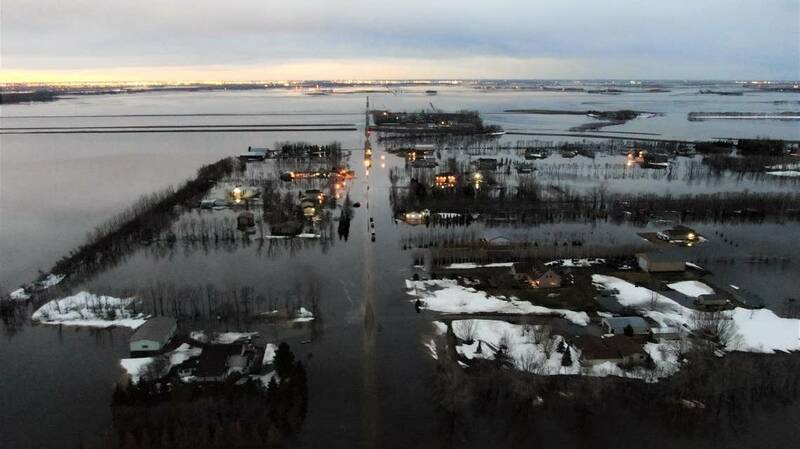 In the southern part of the Minnesota, rivers have crested at least once — but a powerful April storm forecast for the end of this week could cause them to rise again. Forecasters say the springtime storm could dump a foot or more of snow on parts of the state between Wednesday night and Friday. Gov. Tim Walz told reporters Tuesday that he and other state officials are monitoring the developments. "That would be a heavy, wet snow" Walz said. "It would melt relatively quickly in already bulging rivers." Walz said experts have told him that, until now, Minnesota has experienced a perfect snowmelt that has helped the state avoid catastrophic flooding along rivers and tributaries. But the forecast storm brings with it the prospect of additional overland flooding, which is harder to predict and often happens in areas that are less prepared for spring floods than areas along rivers. A $46 million diversion completed in 2015 to protect this northern Minnesota city from floodwaters of the Roseau River has water flowing in it for the first time and is working as advertised, officials say. "It was great to see the project working," Todd Peterson, community development coordinator for the city of Roseau, said Monday morning. "No worry about where the sandbags go first. 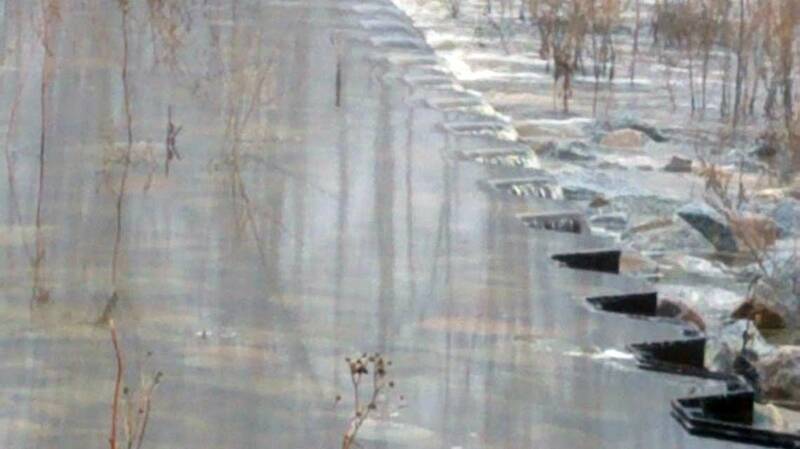 "This the first time we've ever seen water flow over the weir." The 4.5-mile, east-side diversion on the southeast side of the city includes an inlet with a restriction structure near Roseau City Park that doubles as a pedestrian bridge and basically acts as a dam. The restriction structure directs water from the river into the inlet, Peterson said, and the weir, which is about 300 feet from the river channel, keeps additional water from flowing into the diversion until the river gets reaches a certain level. That level appears to be about 16 feet, which is flood stage in Roseau and the approximate level at which water began flowing over the weir Monday morning, Peterson said. The diversion channel then carries floodwaters around the city before emptying into the river north of Roseau at the mouth of Hay Creek. "If the weir wasn't there, the water would have been flowing a lot sooner into the diversion, which again for maintaining the regular flow of the river and not trapping fish and other things in the diversion channel," Peterson said. "They only really want the high, high water to go in there." City crews did a manual check, and the Roseau River in Roseau was at about 16 feet Monday morning, Peterson said, about 7 inches lower than the National Weather Service indicated on its website. The Roseau River in Roseau crested just under 17.5 feet early Tuesday. Because this is the first time water has flowed into the diversion, city crews will monitor the restriction structure and river levels, Peterson said, but the flood protection system appears to have alleviated concerns about flooding in city limits. Peterson said he hasn't gotten any calls from residents wondering about sandbagging or equipment. The east-side diversion was part of a flood protection project completed after the Roseau River flooded the city of Roseau and other parts of the county in June 2002. 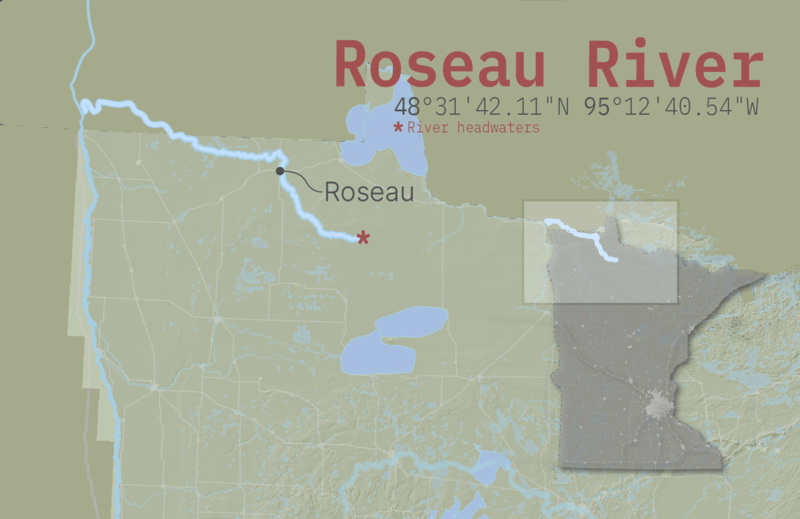 The Roseau River crested at 23.4 feet during that flood, the worst in the city's history. Temporary levees from previous flood fights protect Roseau to a river level of about 22 feet, Peterson said. "We don't even know what kind of flow you'd have to have in the river to get to 22 feet anymore because the diversion will take off so much of that water," he said. A Red River tributary, the Roseau River originates in Beltrami Island State Forest and flows about 215 miles before emptying into the Red River near Letellier, Manitoba. — Brad Dokken, Forum News Service | Roseau, Minn. 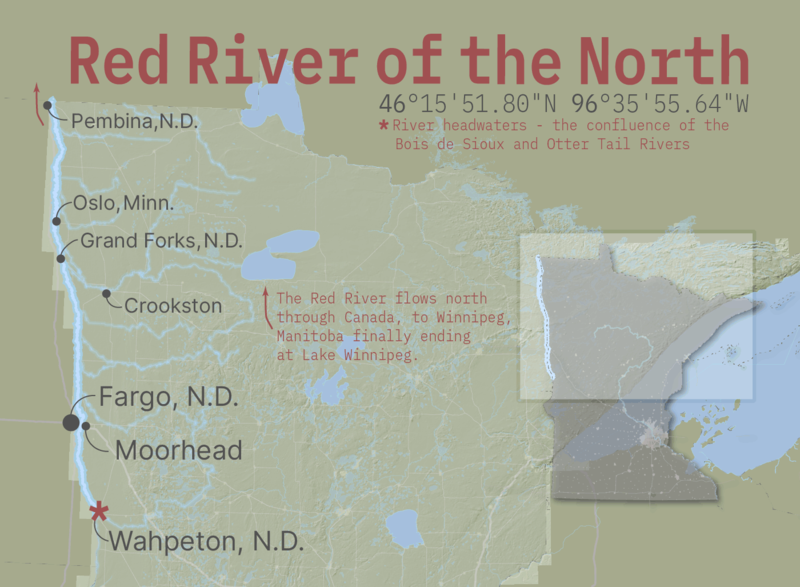 The Red River is cresting in the Fargo-Moorhead area with few problems, though overland flooding remains an issue in rural areas of the valley in eastern North Dakota and northwestern Minnesota. National Weather Service meteorologist Greg Gust says a winter storm expected in the Upper Midwest later this week shouldn't add a lot more moisture to the valley. — The Associated Press | Fargo, N.D.
Floodwaters are causing road damage and closures in northwestern Minnesota. 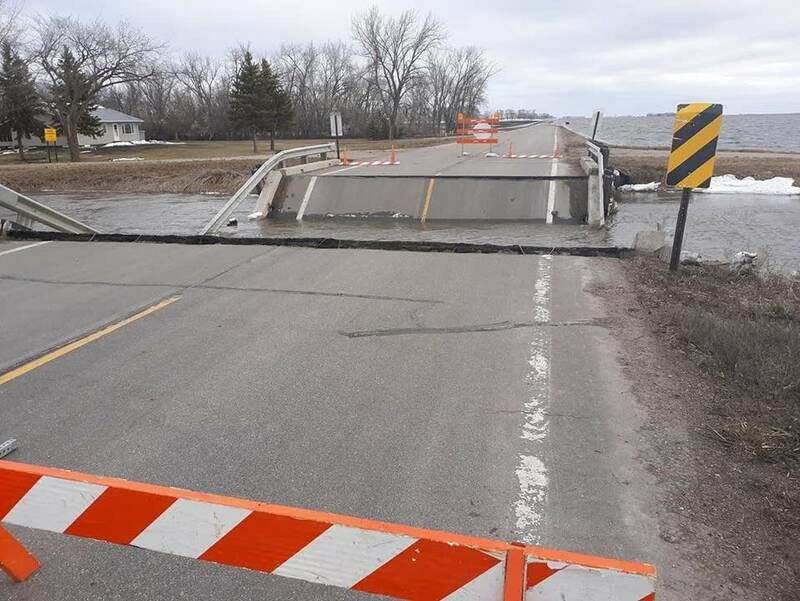 Officials in Norman County reported Tuesday that a bridge over rural County Highway 18 just outside Ada, Minn., collapsed because of flooding. Several other bridges that cross the Red River are also closed to traffic because roads or streets are flooded. And numerous county roads in Minnesota and North Dakota have been closed by flooding as high water on the Red River moves north. The Minnesota Department of Transportation says U.S. Hwy. 75 is impassable because of flooding near Halstad, about 30 miles north of Moorhead. And state highway 220 is blocked north of Oslo because of water over the road. 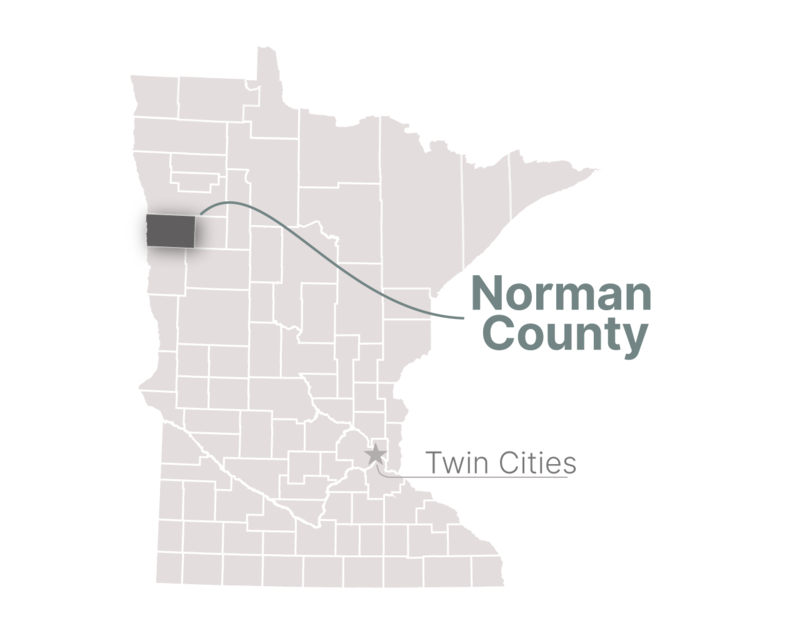 — Dan Gunderson | Moorhead, Minn.
Overland flooding continued to affect several spots in rural Cass County, N.D., just outside Fargo, on Monday afternoon, county officials said. 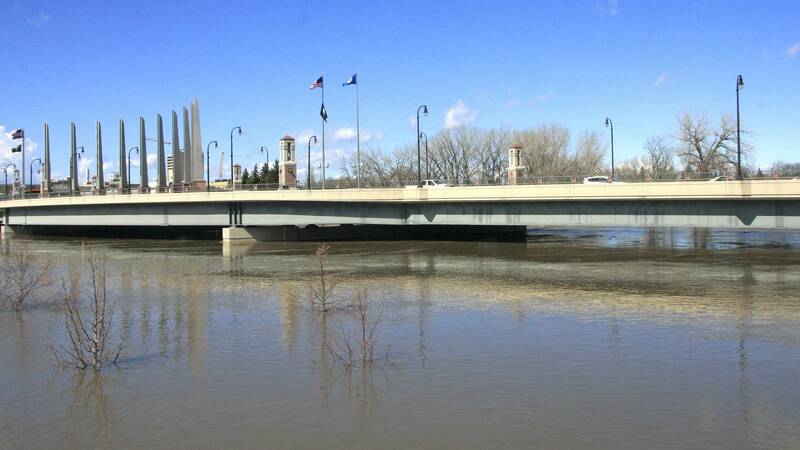 "Of particular concern is the Sheyenne River at Kindred which continues to rise above forecasted levels," officials said in a statement issued at about 1 p.m. The river is expected to crest at 21.5 feet around midnight Tuesday into Wednesday. Overland flooding in rural parts of the county required overnight emergency responses as some areas inundated that hadn't flooded previously, but no problems have occurred in Fargo where the Red River was forecast to crest at 35 feet this afternoon. As of 12:15 p.m. Monday, the river had, in fact, reached 35 feet, according to the National Weather Service. Officials gave an update on flood-fighting efforts at a Monday morning meeting at Fargo City Hall. City Administrator Bruce Grubb said emergency measures were required in five locations — one protected by a clay levee — and no contingency plans are in place. The situation is very different in rural Cass County, where overland flooding remains widespread, triggering the need for emergency sandbag deliveries.